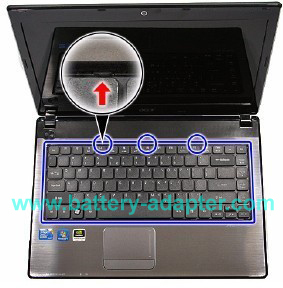 The actual laptop in this guide is Acer Aspire 4741. 1. 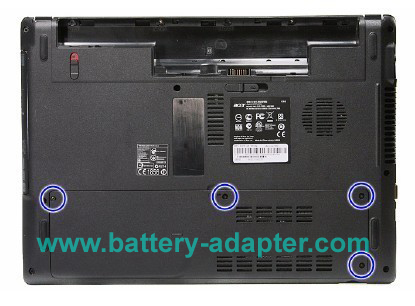 First of all, turn off your Acer Aspire 4551 4551G 4741 4741G computer, disconnect the powe adapter and remove the battery. .
2. 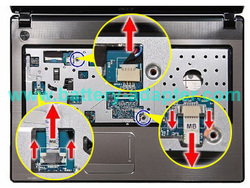 Unscrew the four screws. 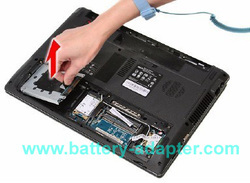 Remove the HDD and Memory Cover. 3. Remove the screws securing the HDD module. Please be careful the screw in blue circle, it is easily damaged. 4. Using the pull-tab, slide the HDD Module and lift the it clear of the HDD bay. 5. 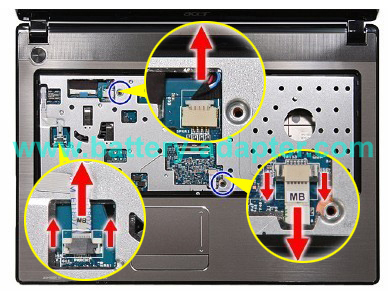 Remove the screw securing the ODD module. 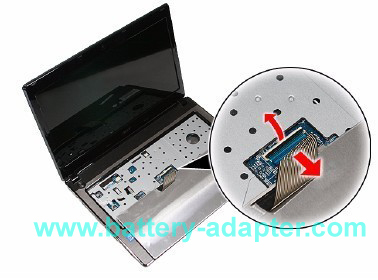 Gently pull the optical drive module out from the chassis. 6. 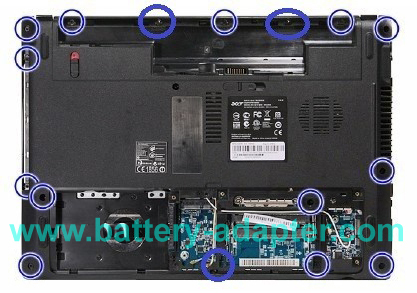 Remove all the screws on the bottom as shown. 7. Turn the laptop over and open it as far as possible. 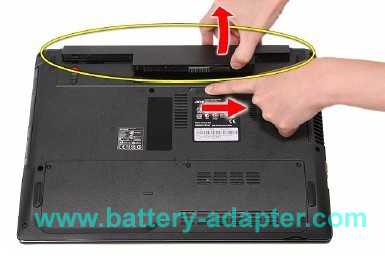 Push three keyboard clips toward the display diretion and release the keyboard..
8. Turn over the keyboard and place it on the palm rest. 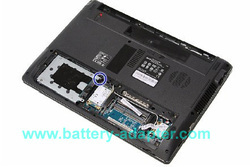 Unclock the keyboard cable connector and uplug the keyboard cable. Now, you can remove the keyboard. If you want to replace the keyboard only, just do the step 7 and step 8. 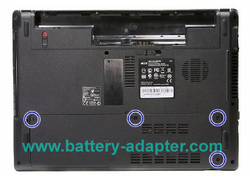 And you can find a new keyboard for Acer Aspire 4741 4741G here. 9. Unscrew two screws circled by blue, they secure the top cover to the chassis. Uplug the three cables, please be careful to do that for avoiding the damage. 10. Now, you can lift the top cover and remove it from your Acer Aspire 4551 4551G 4741 4741G. 11. 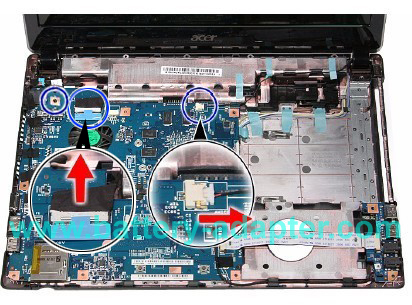 You can access the mainboard now. Unplug the two cables as shown in the picture. 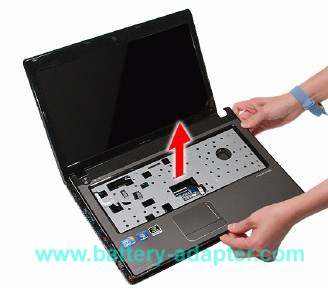 And remove the screw in the upper left corner. 12. 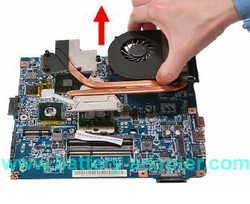 Lift the mainboard and remove it. Turn it over, you can find the cooling module. 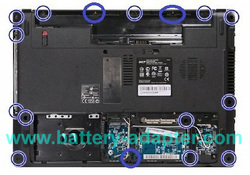 Unplug the fan cable and loosen the secrews securing the cooling module, then you can remove the cooling module . Usually the heatsink is in good condition, you just need to replace the fan only. 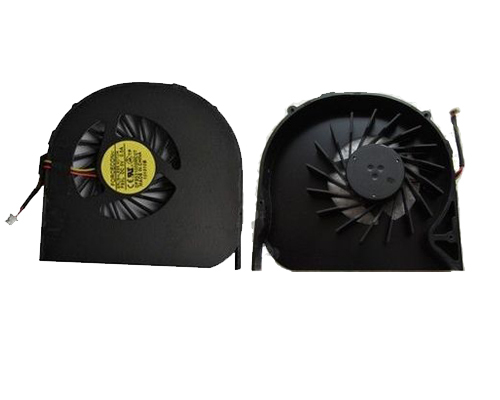 If so, you can remove the secrews on the fan, then you can remove the fan. 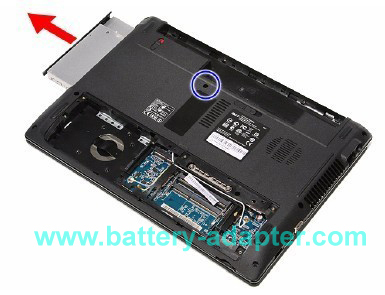 Reverse the procedure to install the new fan and assemble your Acer Aspire 4551 4551G 4741 4741G. Don't forget to add new thermal grease before you fix the heatsink.